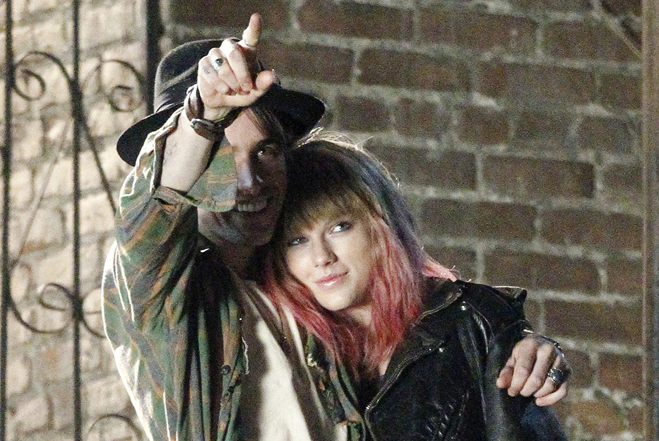 Updated: Watch I Knew You Were Trouble music video. Queen Taylor Swift is back to rock everyone with her third single to be lifted from her recently released Red album. It's confirmed that her next single will give emphasis on I Knew You Were Trouble, her "almost there" attempt on dub-step and techno sound. As of the moment the song rocks each and every charts list, belonging to the elite top 100... so there's no wonder really why this one's the next single in the line-up. It's actually nice to see Taylor Swift sport some unlady-like and non-barbie attire. This rocker look with a pink tipped hair simply reflects the punk and funk of the song. Showcasing her rougher and darker side may just as well serve as a magnet to attract non-believers, haters and skeptics to jump over her bandwagon. She's been very bold with her recent music videos and this one seems to be the boldest of them all yet. The trouble for any Taylor Swift music video is the long wait every follower has to endure. Even a day feels like a month already. and the excitement makes it even worse. Eager as we are, we'll have to wait for a few more days before it hits the cyberspace and if it ever did, I'd surely share it with you. I Knew You Were Trouble single will be released on November 27, 2012.